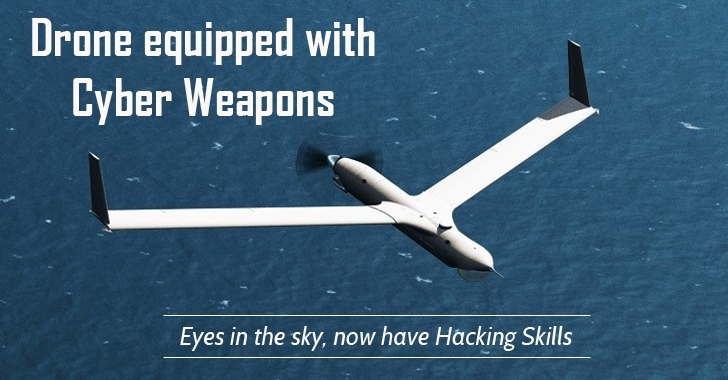 The leaked internal emails from the Italian surveillance software company Hacking Team have revealed that the spyware company developed a robotic aircraft designed to attack computers and smartphone devices through Wi-Fi networks. Over a year ago, some security researchers developed a drone called 'Snoopy' that was capable to intercept data from users' Smartphones through spoofed wireless networks. Now, the email conversations posted on WikiLeaks website reveal that both Boeing and Hacking Team want unmanned aerial vehicles (UAVS) called Drones to carry out attacks that inject spyware into target computers or mobile phones via WiFi. After attending the International Defense Exposition and Conference (IDEX) in Abu Dhabi in February 2015, the U.S. drone company Boeing subsidiary Insitu become interested in using surveillance drones to deliver Hacking Team's Remote Control System Galileo for even more surveillance. Among the emails, co-founder Marco Valleri gave a roadmap of projects that Hacking Team have underway, including "Tactical Network Injector" (TNI) — a piece of hardware designed to inject malicious code into Wi-Fi networks, making it act as a malicious access point to launch man-in-the-middle (MITM) attacks or exploits. In case, if a target makes use of a public Wifi network in a hotel or a coffee shop to connect his/her device to the Internet, the drone could intercept the traffic and inject the malicious code that secretly installs Hacking Team spyware. The mini-TNI request was originated from the US-based Insitu, a subsidiary of Boeing that makes a range of unmanned aircraft systems, including the small ScanEagle surveillance drone and RQ-21A "Blackjack". "We see potential in integrating your Wi-Fi hacking capability into an airborne system [drone] and would be interested in starting a conversation with one of your engineers [Hacking Team staff] to go over, in more depth, the payload capabilities including the detailed size, weight, and power specs of your Galileo System." The email conversation was still in the early stages as of the Hacking Team's leak, so you do not have to worry about drones. Also, it is not clear as to who the customers for the Hacking team's spying drones would be. Though the NSA is very much fond of spyware and surveillance software, there're chances that NSA or other United States agencies would line up as customers of the Hacking Team's Spying drones. Now, you don't have to be surprised if drones are eventually doing a lot more than just snapping pictures.